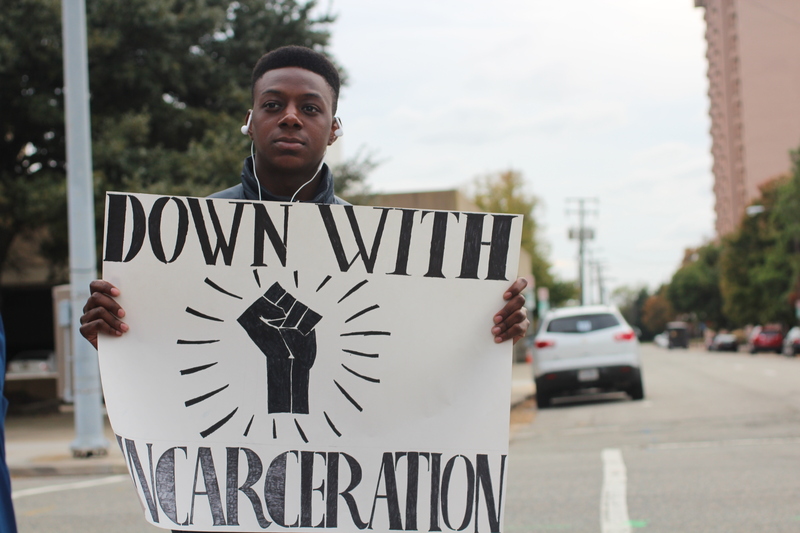 Last week, a group of Hampton students gathered together to protest mass incarceration. 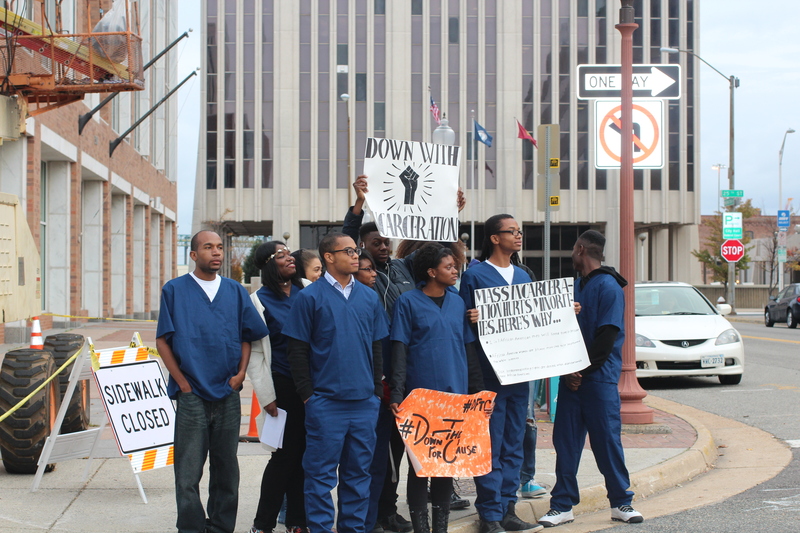 In the “Incarceration Demonstration”, the students stood outside both a courthouse and a city jail. They held various signs with details about the mass incarceration of African Americans and minorities. They also gave out informative flyers to cars passing by. “I thought it was good to see fellow Hamptonians come out and support an important cause” said protestor Wiltorian Mitchell, a freshman political science major from Chicago Illinois. With their signs held high, the students marched up and down the streets of Newport News. To make a statement they all dressed in scrubs similar to what prisoners would wear. Together they made a statement against the disproportionate amount of African Americans that are incarcerated. “A lot of African American men are in jail,” said fellow protester Daryl Riley Jr., a freshman electrical engineering major from Newburgh, New York, “and once they get out, they are looked at differently.” After entering the system, it’s difficult to reenter society. It’s harder to find employment. It’s also difficult to restore one’s voting rights and have any political say. Another difficulty is adjusting back to social norms. Thus a large number of people who were previously incarcerated end back in the system. When describing this issue, Mitchell also said,“the system is set up for recidivism instead of rehabilitation.” Because of this, Mitchell is dedicated to social justice and positively changing his community. He aims to one day become the mayor of his hometown Chicago. Although the prison system creates issues for everyone within , it has particularly taken a toll on African Americans and minorities. The US Bureau of Justice Statistics reported that non-Hispanic blacks made up 39.4 percent of the total prison and jail population in 2009. This is alarming because the CDC has stated that African Americans only make up 13.2 percent of the country. 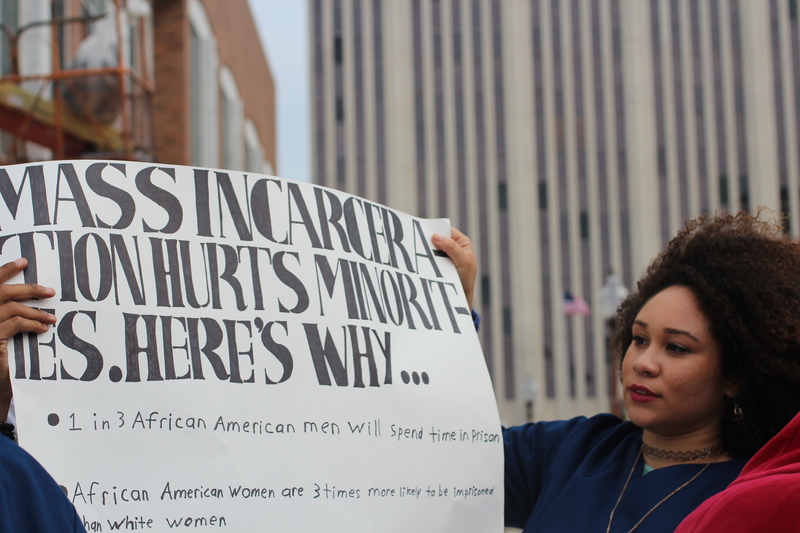 According to the NAACP, African Americans are incarcerated at nearly six times the rate of white Americans. Unlocking America also reported that if African Americans and Hispanics were incarcerated at the same rates of their white counterparts, today’s jail and prison population would decline by about 50 percent. Despite the facts, a Newport News policewoman passed by the group with a heartbreaking message. She told the group of African American students that she was simply doing her job. Although this was disheartening to hear, it only pushed the students to work harder to change their communities. The students continued to pass out flyers with smiles on their faces. The mass incarceration of minorities is a large problem in the United States. African Americans are arrested at a disproportionate rate in comparison to White Americans. Rather than sitting back and idly watching the news, these students decided to take action. These Hamptonians showed that anyone can make a difference and make a change in their communities. Next Next post: Have You “Thanked Your Lucky Stars” lately?